Non woven cleaning cloths are very popular within the food service industry. Designed to be absorbent and often used with a disinfectant spray. These versatile all purpose cloths can be used wet or dry making them perfect for surface cleaning. 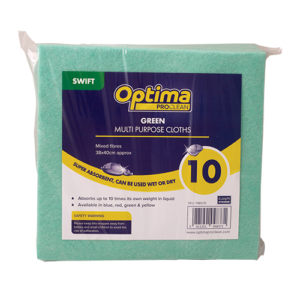 A semi disposable, absorbent and lightweight all purpose cloth manufactured from spun lace material which is perfect for general purpose cleaning. 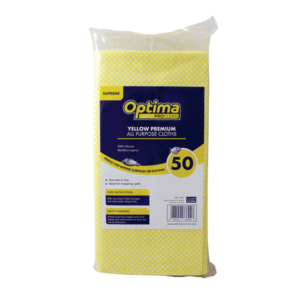 Optima 'Plus' multi purpose cloth offers good all round durability and can also be laundered for extended use. The hydro entangled material with its cellular structure allows for good dirt collection in addition to release. Semi disposable ideal for general cleaning. Semi disposable, general purpose cleaning cloth. 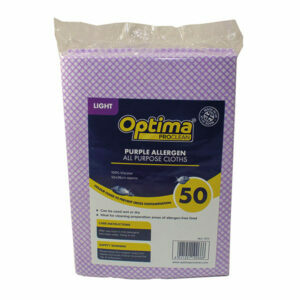 Available in 6 colours to help prevent cross-contamination, including the NEW purple allergen APC. 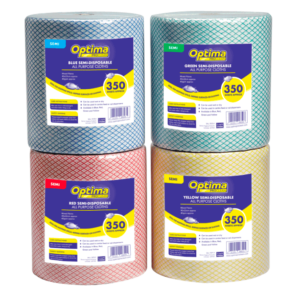 Supplied in attractive printed film under the Optima Proclean brand. This cloth is ideal for wiping surfaces or mopping up spills and can be used wet or dry.Find out more about allergens? A semi disposable, absorbent and lightweight all purpose cloth. Manufactured from spun lace material which is perfect for general purpose cleaning. Premium quality general purpose cleaning cloth. Available in 4 colours to assist against cross-contamination. 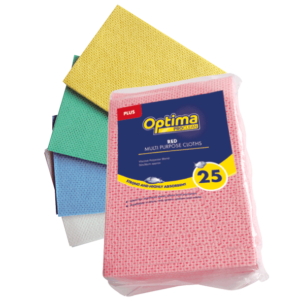 Supplied under the Optima Proclean brand, this cloth is ideal for wiping surfaces in addition to mopping up spills as it can be used both wet or dry. 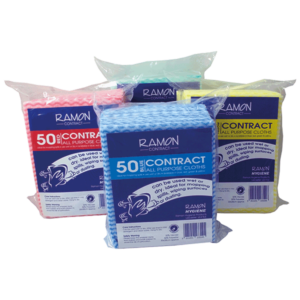 The 'Ramon Contract' all purpose cloths are absorbent and ideal for mopping up spills, they are semi disposable and can be used for general, wet or dry cleaning. 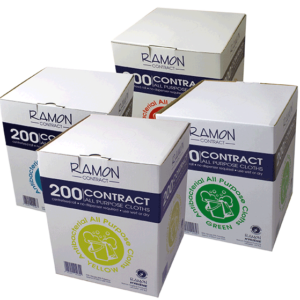 Ramon Contract box of all purpose cloths, specifically designed with the professional contract cleaner in mind. Supplied in colour coded box to help minimise the risk of cross contamination. 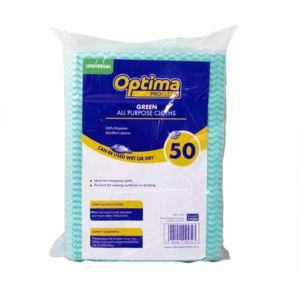 Ideal for general cleaning tasks, this competitive cloth offers good performance, great value and can also be used wet or dry.